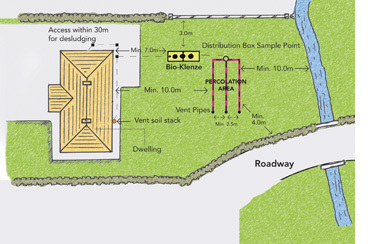 A percolation area is a network of perforated pipes in stone filled trenching designed to distribute clarified (treated) effluent over a wide area, allowing suitable soil adequate time to further treat the effluent before the cleansed liquid soaks down to our ground waterways. It is important that the percolation trench and the Bio-Klenze unit are adequately separated from households and watercourses. High ground water level, soil which will not easily let liquid pass through (thus contaminating the soil creating ponding) or ground conditions where liquid will pass too fast (not giving adequate time for processing/ cleansing) will have the higher T-values e.g. 21-50. Such site conditions will require remedial civil works such as raised percolation/ irrigation areas. The most suitable ground will have a T-value between 5 and 20. 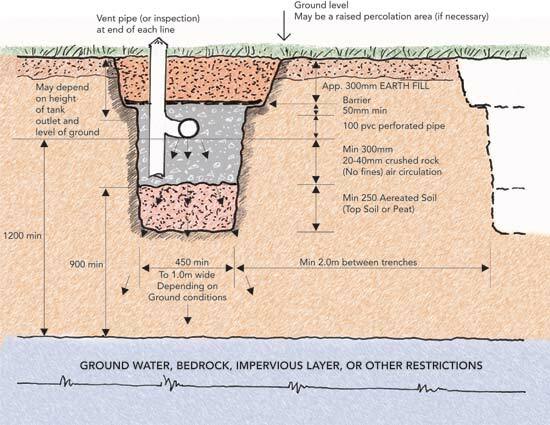 Where Groundwater or ‘T-value’ is high, a gravity flow percolation area may not be suitable and may require a raised percolation bed based on the same principle as mentioned. However, a small electrical submersible pump with a float switch will have to be installed in the secondary settlement tank, to periodically pump out effluent. The Bio-Klenze unit is designed to easily allow the fitting of a reliable submersible pump where required.